Upgrading older stock of army issue guns: If the need is to upgrade or prolong the service life of an existing stock of firearms of the Heckler&Kock G3-types, Kalashnikov AK-series of assault rifles or Rheinmetall MG3 machineguns. Fitting the special designed SAI silencers will completely redefine handling and shooting of these guns, giving the user great advantages in much lesser noise, being much more difficult to discover and point out in firefights, the gun being much more steady giving the user a higher accuracy on increased range, while still maintaining the heavier hitting power from the .30 caliber. We offer different solutions depending on the specific weapon and depending on the needs of the customer. SAI is known in the market as a manufacturer of innovative solutions for handheld weapon systems. With the capability to customise existing assault rifles, we now also offer a viable, cost-effective solution to upgrading AK-47 types. 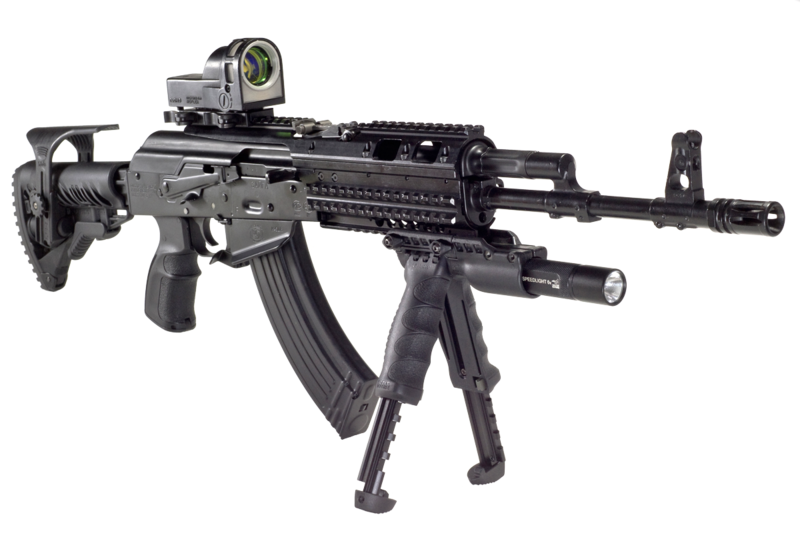 Our AK-47 Upgrade Kit transforms the AK-47 into a versatile assault rifle platform to accommodate a range of ancillary equipment. Our standard upgrade solution is a Integrated 5 Picatinny rail System (*), retractable stock & our famous suppressor / Silencer (KSS+2). All our upgrade solutions for the AK 47 requires NO modification to the weapon. * Five fixed rails provide an exceptional design that allows numerous mission specific accessories, including bipods, vertical grips & large optics to be mounted. Click on the pictures to get the full view. The AK shown is one example to upgrade it. The MG3 has a SAI Silencer / Suppressor mounted.